Today’s Report from the Treasury: Incendiary Language By Geithner? It’s right there in plain sight, all over the 34-page document issued today by the Department of the Treasury’s Financial Stability Oversight Council. If you didn’t catch it, well, that’s a sign that you may be a little too immersed in your bureaucratic bubble. Here’s a news flash: the word “incent” is not really a word. Well, okay, maybe technically it is (keep it in mind for your next Scrabble game). But in the eyes of many stewards of the English language, it shouldn’t be. The ascent of "incent." Image by Chris Hitt. But the difference between “to leverage” and “to incent,” our not-so-scientific research indicates, is that the former is past its peak, while the latter continues to gain currency. 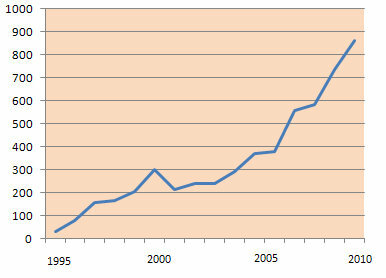 The chart above shows the ascent of “incent” over the last 15 years, as measured by its occurrence in SEC Filings. Its climb has been steady. The word occurred in only 30 filings in 1995. That number had risen to 303 by 2000, to 583 by 2008, and to 863 last year. One wonders: will Geithner’s embrace of the word merely incense grammarians? Or will it actually incent others to adopt the word?